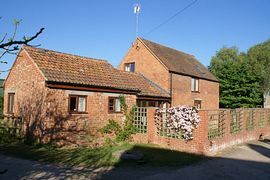 The cottage has been lovingly created from a barn and offers a well equipped space, built to modern standards, with two large bedrooms, two bathrooms with shower attachments, and a large sitting/dining room as well as a cosy kitchen. One bedroom has a four poster bed, ideal for a romantic break. The cottage is ideal for two couples, or a family, and the upstairs bedroom has one double bed and one single. We welcome well behaved pets. There is ample off road car parking and lockable bicycle storage. The Malvern area offers a myriad of things to do, from walking the hills to following in the footsteps of Elgar, and is especially enchanting during the summer. The market towns of Ledbury, Tewkesbury and Upton-upon-Severn are within easy reach and the cottage is only 40 minutes drive from Cheltenham racecourse. Well behaved dogs are welcomed. Turn into Druggers End, and continue for 0.8 miles. Notts Farm Cottage is found on the left hand side, shortly after sat nav has stopped working. Mid Season June until July 2: £373 per week. High Season July 2 - 22 and September 3 - 9: £470.00 per week. Peak Season July 23 - September 2 £547.00 per week. The cottage is available for holiday lets between April and the end of September. Usual changeover day is Friday.